LAWS™ Laser systems utilise a variety of power sources and wave lengths dependant on application and customer preference. Liburdi has supplied YAG and Solid state fibre Power sources for a variety of aerospace applications over the last decade. Solid state fibre laser power sources have exceptional beam quality and characteristics that enable this type of power source to be used for both welding and drilling applications. Liburdi can select and integrate a laser source appropriate to client's application and budget. All LAWS™ 3-8 axis, fully coordinated motion welding systems offer computer synchronized power output control of Lasers. This allows the operator to ramp up or down the laser system power to optimize the resulting weld deposit. Laser pulsing is controlled to maximize penetration and drilling capability. The combination of control and power manipulation results in a versatile welding and/or drilling system. Aerospace applications benefit greatly from the ability to weld on thin edges for compressor blades and or knife edge seals with the use of the patented Liburdi Laser and Wire process. 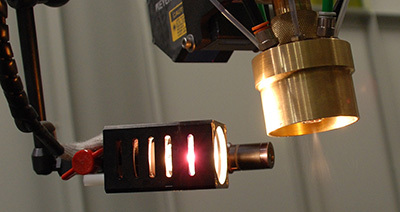 Laser welding heads are integrated as part of the overall turnkey weld development process and are available from a number of manufacturers and institutes. Liburdi can assist you to make the correct decision based on the results desired. 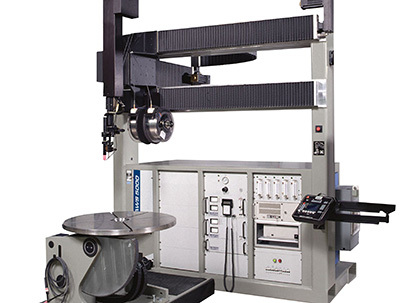 LAWS 3-8 axis co-ordinated motion welding system.